You can always count on Michael Penta for your Septic System Service, Septic Tank Pumping, Sewer and Plumbing needs. Michael Penta started his business in 1991. His success has been based on referrals, quality and repeatedly satisfied customers. We are a family owned septic, sewer and plumbing business and we take care of our customers. Michael Penta services the East, West, and Conejo Valleys, the Santa Monica area and Los Angeles. We are proud to be the local contractor of choice for Agoura Hills, Calabasas, Canoga Park, Chatsworth, Encino, Glendale, La Crescenta, Malibu, North Hollywood, Northridge, Oak Park, Sun Valley, Sylmar, Tarzana, Thousand Oaks, Tujunga, West Hills, West Hollywood, Woodland Hills, Westlake Village and more. All our service technicians are fully trained and certified in the septic, sewer and plumbing fields. Michael Penta stands behind the work of his technicians offering warranties on all worked performed. We understand that septic and plumbing problems can happen at the worst time and are always unexpected. We take that into consideration and offer quick and speedy service. We are experts in all areas of septic, sewer and plumbing services. This includes septic system repairs, installation and pumping of septic tanks, septic tank inspections and certifications, leach field and seepage pits. We refurbish older seepage pits and construct new pits as well. We are also experts in installation and repair of sewer lines, sewer laterals, sewer connections, and offer the latest in trenchless sewer line technology. We also install and repair sump pumps, sewage ejection pumps and perform video camera inspections. There is no job too small or too big for us. 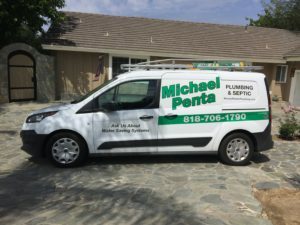 You can always count on Michael Penta for all your septic, sewer, and plumbing needs. Call us at (818) 706-1790 or (310) 839-2686.